The great majority of my play of board and card games is with two. This lead me to The Rivals for Catan, the two-player only Catan card game. From a distance it appeared, when I was assessing whether to buy a copy or not, to avoid a problem if I feel exists in many two-player card games, which is a certain two-dimensionality: passing cards back-and-forth, back-and-forth until the music stops and whomever happens to be leading is declared the winner. Partly, I favour what might be considered a solitaire element to this empty to-and-fro: building a personal machine, though innovative combination of the cards one has the chance to gain. This exists in Rivals for Catan, insomuch as you harvest resources by yourself, and then creating buildings which take advantage of those resources. Though there is direct competition for two victory point markers – a trade advantage earnt through having the most of one symbol on your cards, and a military advantage earnt through having the most of another, points from buildings are more important to settling the winner. However, The Rivals for Catan frustrated me. That frustration is expressed in my initial review, and I traded away the game shortly after. The game is long, and much is decided by the roll of dice. 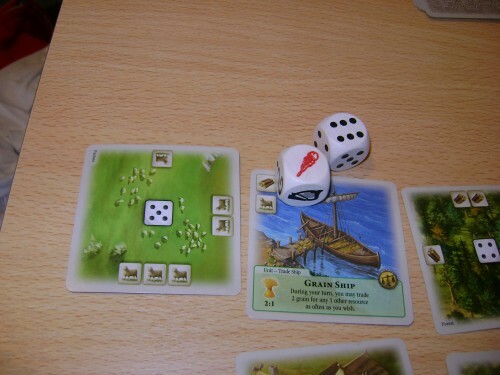 In that a single six-sided die determines collection of resources in this game (in contrast to the two resource dice in The Settlers of Catan) there’s no tendency for particular numbers to appear more frequently: a machine based on, say, rearing sheep, can be scuppered by poor luck. Additionally, and perhaps more importantly, because of the die determines resource collection, one cannot make any firm plans before one’s turn in most cases. 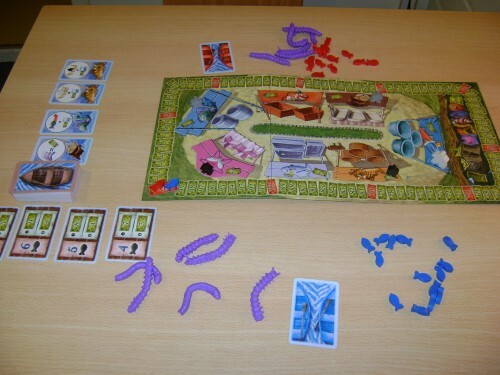 As a result, The Rivals for Catan is not a game I feel any considerable nostalgia towards. Original review from 13th February: What’s the Catch? By contrast, If Wishes Were Fishes! is a game that remains dear to me, and, fortunately, is one that I can find many willing partners to play. I love the peculiarity of a solid game of marked manipulation coupled with silly illustrations of fish and huge squidgy plastic worms. My abiding memory of this game is of those wonderful worms: I love pulling and squeezing them. They also win the game goodwill with some players less familiar with modern board games, meaning If Wishes Were Fishes! can be a neat way to introduce those people to more strategic games. I’m not quite sure how a game like this was ever released, in that styling and substance are so ostensibly distant from one another, but I’m sincerely glad it was. It probably wouldn’t constitute a surprise for me to explain that this review of Notre Dame was the most trouble to write of anything I’ve put on this site. Being a Stefan Feld game there’s a whole hodge-podge of rules here to wade through before being able to say anything of more value. In general, I want in a review, to cut through the rules of a game, and get to what the point in playing it is; I want to explain what experiences a game provides, and what lessons there are to it. What in the game gives you a buzz? What kind of moments do you reflect upon after playing? Is the core of the game concerned with the thrill of subterfuge and deception? Is it about second-guessing your friends and yourself? Do you face a test of character whereby you must leech off your neighbours to win? I want, if you will, to find the soul of a game. In Notre Dame there’s little if any identifiable soul. It’s hard, if not impossible, to look back on the experience of playing and find value to it. The mess of rules masks an absence at the core of the game. 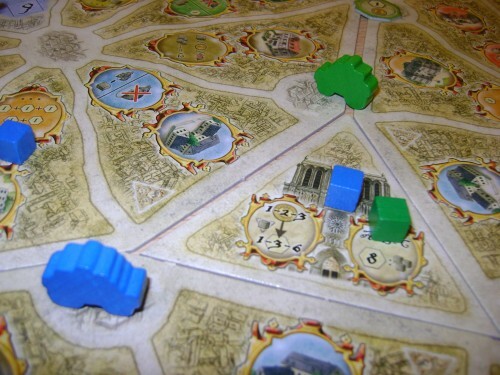 The suggestion in my initial review, that you must perform ignoble actions to win in Notre Dame may be true if one takes the game’s internal logic at face value: you may very well tolerate a rat infestation in your quarter of the city, and you may very well pray that everyone but you donates to the cathedral. But there’s too little heart here to make an advancing plague of rats more than the progression of a black cube along the track, and donating to Notre Dame never transcends placing a cube on a beige space at the centre of the board. The game works in one sense, various approaches can win, but there’s no useful product to that work. Maybe the same seems true with respect to my review of Notre Dame: I’m not sure if, for the reader, there’s all that much value in reading about a game I relate to so little. But considered as an experiment, reviewing Notre Dame taught me a good deal about myself as a player, and something about what it’s meaningful for Painted Wooden Cubes to offer as a blog: there’s more soul in celebrating that which has heart, than in sniping at that which lacks it.